I finished a pair of socks today. I love how they turned out. The pattern is BFF by Cookie A. This is my second time knitting these socks. I finished a darker pair a couple years ago. I'm working on a scarf right now and then I plan to get back to Frances Pool. P.S. Everything went fine with the inspection on the house - now we just have wait for the closing next month. I can't wait! Very nice! I love them! My Frances Pool is on the way. Hope to start it soon. Great socks! Love the socks! Aren't you so talented! Those socks are so cool. I love the color of them. One thing I've never tried is socks, but I can only imagine how warm they are. And I'm so happy about your house. I'm sure that you just can't wait to move in and make it your own. Love the pink socks! How beautiful. Yummy - the darker ones, too. Keep on knitting to stay warm - Frances will be patient. They're predicting frozen precipitation tomorrow. Good news about the inspection. Waiting is the hardest part! Congrats on the inspection ~ hope all continues to go well! Love those socks! Love the colour. 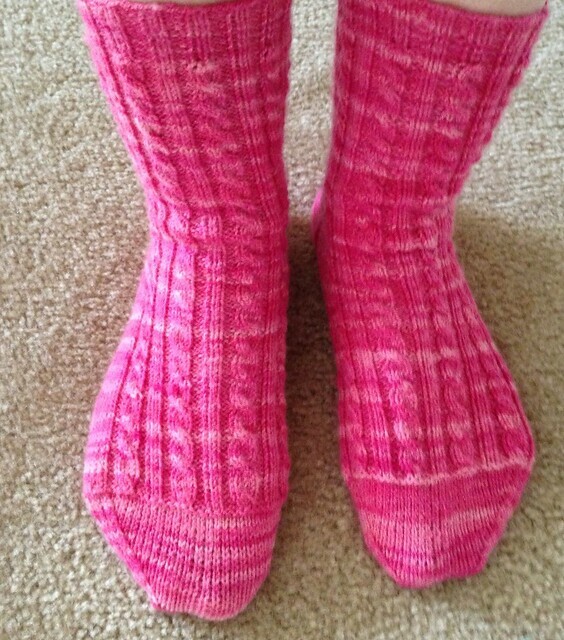 One thing I struggle to knit is socks, but they look perfect. Oh those are so sweet!!!! I wish I could knit a sock! And that colour is just perfect! I am jealous that I am not the owner of those socks! I LOVE PINK! Beautiful. How exciting about your upcoming move, Nicole. Best of luck, and I hope everything goes smoothly. Those are pretty, Nicole! I love that color!